the changing needs of customers, employees, regulators, partners and others. In fact, many experts believe that the opportunity for enhanced business agility through virtualization represents a significant paradigm shift for both business and IT leaders. 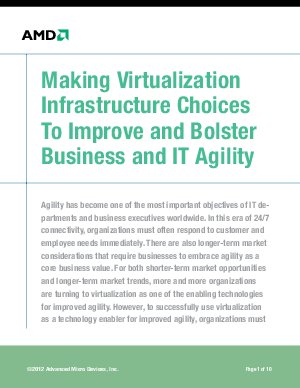 Download this whitepaper to learn about making virtualization infrastructure choices to improve and bolster business and IT agility.